Private house selling and letting is more popular than ever as it gives you the flexibility to sell your property without the excessive estate agent charges. To give your property the edge when it comes to generating interest there aren't many better ways than custom printed For Sale Signs, To Let Signs and other property signage / Correx is our most popular type of estate agent board, especially with the recent popularity of private selling. Perfect for customised For Sale, To Let and Sold signage. 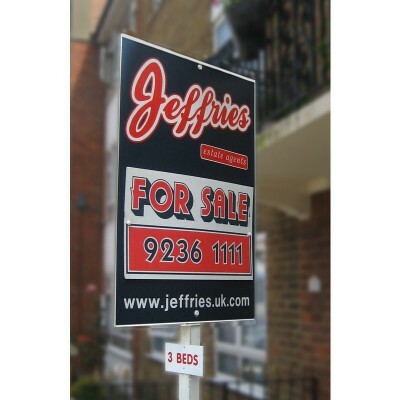 Our property boards are rigid Correx, durable, lightweight, weather proof and have superb fire proof ratings. Available in sheet sizes up to 3m x 1.5m and in popular thicknesses of 3mm and 5mm. This versatile material can be easily fixed with double side tape, screws or velcro. Graphics are printed onto long life self adhesive vinyl and laminated onto the foamex. Finished panels can be easily square or cut to shape using our state of the art flat bed die cutter.